The battle for a UEFA Champions League place and the battle for safety headlined the latest round of action in the top flight of Italian football. A missed opportunity for the Granata… With Parma missing several key players including Gervinho, Roberto Inglese and Bruno Alves, Torino had the chance to put pressure on the teams above them and push for a top-four finish. However, they were devoid of any ideas. Except for a few half chances from Daniele Baselli and a late breakaway from Vittorio Paragini, there was nothing much else in this encounter. The Crociati are basically just seeing out the season now, while Toro hopes for European competition took a dent. Yet another controversial match between the two arch-rivals soon after the Supercoppa Italiana… Krzysztof Piatek missed a glorious chance to give the Rossoneri an early lead, but his header went wide. The Bianconeri were playing within themselves, surely with one eye on their UEFA Champions League quarter-final clash with Ajax and the away side were the better side. Gennaro Gattuso’s side were denied a clear penalty when referee Fabbri, even with the use of VAR, missed an Alex Sandro handball; this is something that the Italian Referees Association has since admitted was a mistake… Milan eventually took the lead when Piatek collected a pass from Tiemoue Bakayoko and slotted the ball into the net. It woke up the home team and just like that, they sprung into action. Federico Bernardeschi forced Pepe Reina into a fingertip save late in the first half. On the hour mark, Matteo Musacchio made a sliding challenge on Paulo Dybala in the penalty area, and the Argentine got up and slotted home the spot kick. This match had several unsavory incidents as is to be expected in this match; including between Musacchio and Mario Mandzukic as well as Alessio Romagnoli with Mandzukic. Inevitably, Juve got the winner and it was that boy again, Moise Kean! The teenage sensation collected a pass inside the penalty area from Miralem Pjanic and he coolly scored with the calmness of a veteran. Juve are just one win away from an eighth straight title, while Milan’s top four hopes are in serious jeopardy. Roma are back on track in the race for the Champions League… The Blucerchiati dominated the first half and missed good chances through Fabio Quagliarella and Gregoire Defrel; the teams headed 0-0 at the break. 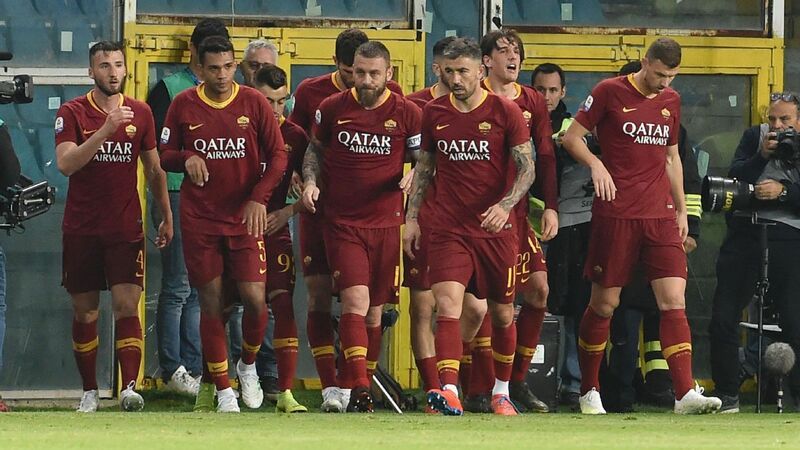 It was the Giallorossi who took the lead, with a scrappy goal – a corner was flicked on and the captain, Daniele De Rossi, was there to bundle the ball home and the away side never allowed their host to equalize. Defrel had a late counter-attack chance but he failed to convert late on. Both teams will still fancy their chances of Champions League football. Frosinone shocks Fiorentina in Tuscany… Both teams went for the win this game, but it was clear that it meant more to the away side. Alban Lafont was busy in La Viola’s goal having to make a few smart saves to keep the score level at the break. The home team seemed to lack that bit of motivation and were duly punished late on, as Daniel Ciofani scored with a lovely turn and finish that went into the corner of the goal, and his team had the three points. Fiorentina does not seem to have the fight for Europe, while Frosinone are seven points from safety. A brilliant relegation six-pointer thriller that was won by the Friulians… The Tuscans took the lead with a training ground move. From a free-kick, Rade Krunic sent Francesco Caputo through and the Empoli skipper scored with a first-time finish. The equalizer from the home team was a thing of beauty as well. Stefano Okaka led the counter, passed to Sefo Fofana, he dummied over the ball to leave it for Rodrigo De Paul, and the Argentine international unleashed a scorching shot into the top left-hand corner of the goal. There was much more to come! 10 minutes later and a lovely free-flowing move from the visitors and they were out in front; It was left to Krunic to finish off the move with an inside out right-footed curling effort. On the stroke of half-time, the home side leveled again, with a De Paul penalty, after Kevin Lasagna was pulled back when he was heading towards goal. As it seemed, the teams would go into the locker rooms on level terms, Rolando Mandragora gave the home team the lead, with an accurate finish after his team’s free-kick had hit the wall. There would be no goals in the second half as the home team held on, despite going down to 10 men, when Marvin Zeegelaar was sent off. Udinese are four points above the drop zone with a game in hand, while Empoli occupies the last relegation place. Another relegation battle won by the home team… The Sardinians took an early lead as Paolo Farago scored a rebound after a long-range shot from Nicolo Barella was saved by the Spal goalkeeper. The side from Ferrara were back on level terms after the referee – with the help of the VAR – awarded the away side a spot kick; Mirco Antenucci converted. Barella had another shot saved, but his side were soon be in front again – a lead they would not give up a second time. A cross came in, Cagliari hit the crossbar and it was left to the recently capped Italy international Leonardo Pavoletti to score with a header. Cagliari are eight points above safety, while Spal are four above the drop. More drop points by the Biancocelesti in their European ambitions… In the first half, Lazio were the only team pushing, but no goals were forthcoming. However, that all changed after the interval. The home took the lead in somewhat controversial circumstances as the referee adjudged that Manuel Locatelli handled the ball in the penalty area and Ciro Immobile stepped up and converted for his 14th of the campaign. The Neroverdi were level soon after through Rogerio after brilliant work from Jeremie Boga on the right. The home team carved out three glorious chances to take the lead, but a combination of poor finishing from Immobile and a superb save from Consigli on Sergej Milinkovic-Savic kept the match level. This was not for long though as on a classic counter, is was the Emilia-Romagna side that took the lead through Domenico Berardi in the 89th minute. But it does not end just yet – the home team salvaged a draw in the fifth minute of stoppage time through Senad Lulic, finishing off an Immobile cross. Whew… What a match! Lazio, despite their recent struggles, know that a win in their game in hand versus Udinese will bring them up to fourth spot. A drab draw between two European chasing teams from Lombardia… The home team created a few chances including a Matias Vecino lob that forced the Bergamaschi goalkeeper into a save and Mauro Icardi missed a one on one inside the box. La Dea were uncharacteristically subdued in this match and created little of note. Radja Nainggolan missed a late chance for il Biscione, but the Atalanta keeper was again there to deny the home side. Inter have a five-point cushion over the fourth place which is currently occupied between Milan and Atalanta. A draw between these twinned teams… The Grifone had Stefano Sturaro sent off after a horrendous tackle on Allan; the referee used VAR, after he had firstly just given the former Juventus player a yellow. The Partenopei took the lead soon after through a Dries Mertens shot from outside the box. However, the Ligurians equalized at the very end of the first half with a neat move; Christian Kouame held off a few Napoli defenders, passed off to Goran Pandev, the former Napoli player floated a cross, and Darko Lazovic was there to volley it home. The Campanians tried to get the winner but to no avail. Napoli’s entire season rest on their UEFA Europa League campaign, while Genoa obtain a valuable point away from home. The Rossoblu rise above the drop zone… Except for a Riccardo Orsolini chance, neither team created much in the first half and they headed to the interval scoreless. After the break, January signings Roberto Soriano and Nicola Sansone earned the home team a couple of penalties and Chile international Erick Pulgar converted both within the space of three minutes to give his team a 2-0 lead. Late on Mitchell Dijks scored from a pass from Sansone to wrap up the points. Bologna once again move out of the relegation zone, while Chievo could very well be confirmed in Serie B next season this weekend.